A DOS Extender is a software tool that enables developers to access extended memory beyond the 640K DOS limit. The DOS extender functions as a layer between DOS in real mode and an application in protected mode. It is embedded into the program and is invisible to the end-user. Phar Lap&qout;s DOS extenders support all the major industry standards-DPMI, XMS and VCPI-so that Extended-DOS applications can run under DESQview� and all modes of Windows�, as well as DOS. TNT DOS-Extender is a 32-bit development tool that enables programmers to build multi-megabyte applications that take advantage of powerful NT features, including DLLs, threads, and multitasking under DOS. TNT also includes the WinPipe VxD which enables developers to write a Windows GUI front end for their 32-bit DOS applications. 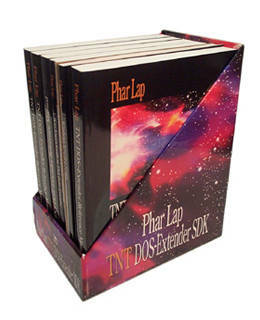 TNT DOS-Extender runs on any DOS-based 80386 or higher PC and supports a wide range of 32-bit tools, including Borland C++ 4.0 and the Microsoft Visual C++ 32-bit Edition compiler. The Software Development Kit (SDK) includes, in addition to TNT DOS-Extender, a 32-bit version of the Microsoft CodeView debugger, Phar Lap&qout;s 386|ASM macro assembler, 386|LINK linker, 386|LIB librarian, and 386|SRCBug debugger.